The 1991 Group C mod includes the Mazda 787B, Porsche 962C and the Sauber C11 in the latest version of the mod for rFactor 2. Featuring unique realistic physics for each vehicle as well as different tire compounds, this is your chance to get behind the wheel of the three most iconic racing cars in the history of Group C racing. - 1991 Mazda 787B model by Ionut Nicolaescu, updated by Dmitriy Barishev. - DX9 car now retired by new version. - All cars fully rebuilt, reworked and running to DX11 standard. - All physics brought up to current standard and optimisations as well, more detail below for the guys. - Motec display redone for the Mazda 787B to real car layout and new low fuel warning, thanks Damian. - Oil Temp added in to the secondary display area in the Porsche cockpit. - All materials have been fixed and adjusted and mesh quality increased in places to enhance the experience. - All little things like external cameras clipping for example, looked into and corrected. - We are optimised for night racing as well, but bear in mind that environment at night is not complete there yet . - Complete re-balance on all items visually. - A lot of real life balancing visually on all cars. - New corrected tyre sidewall for the Sauber, before was unbelievably, inverted. - Mazda now correctly has centre of origin for spinner and external cameras. - More Sauber Cars added to balance car skin ratios better, thanks Alavaro. - All custom skins improved for DX11 build - thanks to all the skin guys Damian, Daniel and Arturo. - Only functionality missing is fully working wiper functionality currently, but rain support is included already. - Engines now have three mixture positions. - New Ultrachassis added with revised suspensions geometries/chassis flex. - New CPM tyres with the latest options. Compounds have different grip and warming levels to match the different tracks. - Reworked diffuser and relocated. - Revised AI to match real driver behaviour as much as possible (variable from track to track) and improved performance in wet. - Front and rear downforce from the bodywork revised. - Clutch torque revised for shifter and pad options. - Added engine power detail on garage. - WSC engine have a new turbo flow. - Rear Goodyear tyres now uses 18 inch rims instead 19 inches. - Improved performance (less drag, more grip, etc). - Updated engine brake torque, throttle maps, mixtures and softened turbo pressure build up. - Reduced drag caused by rake. - Added undertray points and improved collision detection and aerodynamics while flipping in the air. - Updated tire construction materials and resolution (more flexible and detailed). - Improved all tires thermodynamics, wear and grip for wet weather. - Reduced rubbered path effect on tire grip. - Reduced grass, dirt, and other terrain types effects on tire temperature. - Mazda 787B: Improved low rpm power range and high rpm coast sample. - Porsche 962C: Added high rpm variants for exterior engine. - Sauber C11: Increased turbo intensity. - All cars updated to cockpit damping feature. Today's release is not a final version. Because the sim is improving and changing from build to build, some things may come out and will need to be fixed. Also, we are aware there is still some room for improvements in both graphics and physics in our mod, so please expect updates released in the near future. FVR V8Supercars 2014 to 2016 simulates the 2014, 2015 and 2016 Australian V8 Supercars Championship. We have tried to get as much detail in these as we can imagine. We also have a User Interface for the mod to have a subtle blend colour. The mod has multiple options in it to suit various configurations of how you want to drive, you can change configurations of the cockpit. The diff ratios and tyres are set for the Australian tracks, with subtle annual changes. Please understand that if you find a fault we are only human let us know as we may be able to update. We do this for our own enjoyment and hopefully yours along the way. Uninstall all previous versions. The design goal of the D4 was to put as much power as possible into as small and light a package as possible, while still being able to use it, and still provide a high level of safety. The Hillclimb configuration is the ultimate D4, with over 350hp in a AWD chassis weighing just over 425kg. Even the base Trackday configuration is still potent, with over 170hp, packaged in a car that weighs slightly more than 400kg. Despite the light weight and small size, the D4 is designed to share the track with much larger cars, and is overbuilt for a car of its weight class. Developed by Palatov Motorsport & Slow Motion Group, this new build 1.57 brings several “hidden” improvements to the physics, to better match the evolution of rFactor2 in the last year and half. A new 2017 revised steering wheel has been added to match the evolution of the real life Palatov D4 and were made a few improvements to the graphics, with the goal to enhance the user's experience without altering the great feeling of this awesome prototype! The steering is now more precise. Strong steering FFB still communicates the road surfaces just like the real car: this is a feature of the Palatov D4! Those who wish less intensity may use FFB Multiplier below 1.0 to reduce FFB strength. Don’t forget to subscribe / download also the Oregon Raceway Park Circuit, where Palatov Motorsport conduct most of their real world testing. This has enabled direct comparison with logged data and video from the real car. Stock Car Resurrection 1971-1972 is a rFactor 2 mod that simulates American stock cars from the early 70’s. It currently has 6 makes/models and over 60 paint's/teams. Special thanks goes to MoparBob. It was his original brain child. He was responsible for acquiring the exterior models over the years. He Painted 99% of the cars. He was even able to speak with Dale Inman (Richard Petty’s crew chief) to help on some physics information. More thanks goes to ISI. The physics are based off of their 1974 Dissenter mod. I am also using a few things from their 2015 stock car mod (sounds, shifter boot model, ect..). Lastly thanks Studio 397 for the new support. These are big heavy rear wheel drive cars. With big heavy high horsepower engines sitting over the front wheels. They use bias ply racing slicks which makes them challenging but rewarding to drive. You will want to ease it into the corner and accelerate as hard as you can on corner exit. Taking advantage of the engines power down the straights. Capable of reaching speeds of 200+ mph. However they are not very aerodynamic and if not for the front air dam and rear spoiler they would actually create lift. Imagine the 1974 Dissenter mod with more horsepower, removed some downforce, and changed some of the garage adjustments. Added things like an adjustment for the front air dam and rear spoiler. Currently all of the cars use the same physics. A few things to remember. This is my first rFactor 2 mod. I have enough knowledge to get by when it comes to RF2 modding (3d modelling, 2d textures, physics, track building, ect). However I am not an expert at any of it. This is just my hobby. Also this is a BETA. Which means you should expect somethings not to be right. Up to this point it has only lived on my computer. I am sure there will be unforeseen issues. If you would like to contribute with a good setup or a paint from a team that is missing feel free to message me. Lastly I have not made any LOD's yet. This might hurt the performance of your pc. They will come in a later update. Uninstall older version to make this work correctly. This is the final release of this awesome car. It has been a long journey which came finally to an end. I will soon open an other mod thread where I will post all sources which came with this project, so if there is something you don't like about the car..... Make it better yourself. For me this in a closed chapter. Time to start create something new for this awesome sim. Thanx go to Dennis Coufal, Sven Hielscher, Frederic Schornstein, Joao Fernandes, Knut Omdal Tveito, and everyone here at RaceDepartment who supported me and helped me along the way. V1.00 comes with the 2 version of the Bmw M6 race car, the GT3 version and GTLM Version. Further technical characteristics of the BMW M6 GT3 are the drive concept, six-speed sequential racing transmission, and high-performance motorsport electronics. The aerodynamic properties of the chassis have been optimised in the BMW wind tunnel. The engineers worked meticulously to fine-tune the BMW M6 Coupé, which formed the basis for the new car and was already perfectly suited to outings on the racetrack. closely with the BMW Team RLL – BMW works team in North America since 2009 - in Munich to implement the modifications as efficiently as possible. Unlike the BMW M6 GT3, the BMW M6 GTLM must not have ABS. At 1,250 kg when empty, the BMW M6 GTLM is also about 50 kilograms lighter and has a slightly longer wheelbase. - The Bmw M6 GT3 will appear on Vehicle selection under "GT3 World Series"
- The GTLM Version will appear Vehicle on selection under "Simtek Bmw GTLM"
- The cars have different physics and different feel, lap times are consistent with real cars! and offered him i will improve the graphics of the model. As I worked on the model i fell in love in the car so much i decided to look into physics too. from the said mod. I dont think there is anything left from the original really, but i am not sure. based around their love to caterhams and rF2. For endless patience with my moods and loads of knowledge sharing about rF2 modding. range of data and information about the suspension of this beast, all for free just as part of his love to caterhams. Tier 1 Supplier to many major car manufacturers for Design, Manufacturing and Assembly services. In particular supplier to Caterham for over 20 years for many suspension, steering, powertrain and transmission components. Our model of caterham shipped with open diff and TITAN is a very popular aftermarket choice for a limited slip diff. I contacted them requesting their help in pursuit of data, they were more than willing to help, supported me over the time and simply made it very obvious they love these cars as much as I do. They have my gratitude for their help without asking anything back for it. Tim has been around this mod since forever. He owns a very similar version and has been providing me with contacts, advices and help over the whole two years. Always quick to reply. He also has been the number 1 feedback provider, telling me how and where the mod does not feel quite right. As my Thank you Tim I included your caterhams skin and your helmet in the mod. To the best of my knowledge no longer active in sim racing world, thank you for your rF1 mod from which this all started. Walking car encyclopedia, very busy person yet still finding huge amounts of time to help me with this car. Never asking anything back for it. You have my never ending gratitude. This is entry level Caterham 7 Classic edition 1.4 K-series. As stock it comes with open differential, street tyres and 5 speed manualy H-pattern gearbox. We have included some upgrades to this baby, the most significant one is the limited slip differential. The LSD makes the car faster around the track, but not neccessairly more fun. That is to anybodys preference. You should almost treat it as two completely differend cars, one with open diff and one with LSD. So make sure you use differend setups for it. The engine is humble inline 4 with peak 105HP and 128Nm of torque. This is not a dragster for sure. You will notice significant drag and with it also significant slip stream effect. Its a lot of fun close racing on these. sensitive to setup changes, your over/understeer balance is mostly tweaked by adjusting the rake (front to rear ride height) but there are more means you can play around with. Regarded by many as the best car BMW ever made, the BMW E39 was released in 1996. The M5 was introduced in 1998 at the Geneva Motor Show, although production did not begin until late October of that year. The E39 M5 uses the S62 V8 engine, which produces 294 kW (400 PS; 394 bhp) mated to a Getrag type D six-speed manual transmission. Included in this version is the 18" M Parallel Style 37 Wheels, and you can choose from 8 standard factory colours. *All original content is the property of the original authors. **Not for commercial use, or to be used for financial gain. * Graphics : High fidelity 3D models, with high definition cockpits. * Graphics : Hundred's of real paints reproduced for each cars. * Graphics : Highly improved car materials, reflections, lightnings and shadings. * Graphics : Animated car driver, with high definition 3D Helmet. * Graphics : Cars details with backfire, headlights with lens flares, deformable tyres. * Graphics : Specific mod UI, to be downloaded and installed separately. * Physics : Up to date rF2 physics features for all cars. * Sounds : Accurate and detailed sounds for all cars and engines. * Sounds : Up to date rF2 sounds features for all cars. * Dynamic dirt on cars. * Damage fine tuning (Not correctly yet implemented in rF2). * Animated wipers in cockpit (Not correctly yet implemented in rF2). * Tires wear on standard tracks : 1h SOFT, 2h MEDIUM, 3h HARD. * BOOST is available on all cars (But not yet feature FuelMixture wich is in progress for next build). * Traction Control is available on GTE & P2 cars. * It's recomanded to open the Upgrades (via TUNNING of the ShowRoom) for each cars. * There are graphical upgrades like customised mirrors for unique display screens, and physics upgrades to adjust the FFB power. * Think about checking and adjusting your FFB Minimum Torque in the Controls Setting panel in the game. Increase it until you get light ocillations to avoid the low force in the middle gap. This mod is a standalone version of the ISI_Renault_Megane_Trophy_2009-v144/145. All credits goes to ISI and many thanks to ISI for the permission! Last update for all. Further updates will be uploaded to the workshop only! ISI for rFactor2 and the original Renault Megane Car, Chris (redapg) for his extensive help, senormen, isr corti, hexagramme & Scott (TPG) for testing and Lazza for his advises about DRS. Graphics : Added New bodywork shader. Graphics : Added New rims shader. Graphics : Improved Windshield texture quality. Graphics : Improved Motec writtings quality. UI : Added New UI background design (coming in a separate file). Physics : Update of tires (understeer in front tire fixed). Physics : Downgrade of performance (to reduce and back to laptimes closer than Cup). Physics : Addition of Auto Blip Upgrade (Off by default). Physics : The old setups are not compliant with new physics. Physics : Update of IA performances. We are proud to introduce the 1971 Porsche 917K mod. Version 6.0 needs you to totally remove previous versions. If you fancy yourself as a skinner, please feel free to help us out on the 2013 skins and we can post the mod into the list. Version 6.0 has some all important physics tweaks and hopefully all cars are visible this time, Coulthard was missing. We are proud that this mod was built from the ground up at FVRFactor. 99% of the mod is scratch built, wretched thing the wipers and driver. We also have a User Interface on our website for the mod. The mod has multiple options in it to suit various configurations of how you want to drive. We have incorporated 5 years of trackconfigs so we have captured diff and tyres and depending on your track year should rubn the correct items. The 2015 season is included with test skins and Adelaide skins at present. There is the new 2016 and the old faithful 2014. There is our newly modelled VF as promised for the 2015 and 2016 series plus the inclusion of our FGX for 2015 and 2016. All 5 cars represented over these years were built in house from scratch by our FlashQld, painted by Ferret40. Sounds were done by Bebop01 who has since departed to do other things. dBens1 and Feralarri have combined on physics and tyres, with Feralarri assisting me to compile this latest version. We are but a small team of friends spread out on the East Coast of Australia to Tasmania. Please understand that if you find a fault we are only human, this is a hobby and we're not waging any wars over this. If you don't like FVR don't download because we've been there and we do this for our own enjoyment. If you don't like it then you don't like it but if you do that's great. We'd love to hear from you if you do. Please don't rip any parts from it (those that threatened they would) we worked a long time on this and please show some respect in the process. This mod is CPM enabled. FVR Special Access Members for their testing and fault finding. A few of you guys went above and beyond, stay tuned for some more testing very soon. FVR Members for just being there. Racing-Leagues.com for their support and testing. They have a 2016 series starting January all welcome. Small fixed done like mirrors broken to more parts so they are setuped separetly now. Missing mesh on front window added and few other smaller adjustments. This version is for testing now and if everything is good, we will implent same things to whole EGT. Thank you Miroslav Davidovic for the hard work on physics! -Added 6 sets of new CPM tires (4 slicks, 1 inter, 1 rain) : s6 and s7 medium tire for double stints with different heating characteristics, s8 hard compound for tripple stints, s9 1h compound on medium tire performance. Its the Corvette that raced in ALMS and 24h Le Mans 2013. Sounds are new, done by Davide aka elMariachi90, 3d model of exterior/cockpit was done by me(Ales Ogrinc) and Revelli, ingame/templating/texturing by me. Most of the changes where requested through the ISI Community. A lot of people tried to contact 32_pixels, without any success. I tried to contact him by PM on the ISI Forum and on Facebook but got no feedback from him. SRosswick (he made the skin pack) tried to contact him since October 2014, no luck. Other tried it, too, but no response. For now, there are new features and parts added, many changes and fixes on most parts of the old version (incld. on the 3d model) done. Therefore i decided to release this new version without permission. - Because of the new carbody i decided to put all ad`s into the skins, EXTRA3 layer isn`t available in the new version. Installation: copy the .rfcmp file into your package folder. Finish installation with the Launcher or the ModManager. If somebody feels, that this car have to much grip or to much downforce, just decrease the rear wing value and use the hard tire. Default are the soft tire. alpha-bravo, guimengo, Justy, Scott, SRosswick, tjc and the Driver from the TPG League. Special thanks to Scott (TPG), he was really very helpfull with endless & patient testing! Annother big thanks goes to my son Juergen jr. He made the 3D Model changes, wich was needed for the moveable/detachable parts. Have fun & keep racing! This version is for testing now and if everything is good, we will implent same things to whole EGT. Thank you Miroslav Davidovic for the hard work on physics! One month ago a friend of mine asked for the conversion of the famous iDT FunCUp, the beetle... that was very funny and very used in rF1. The guy(s) of iDT started the conversion a lot of time ago but never ended it http://isiforums.net/f/showthread.ph...cup-Conversion, so I asked for the permission to port and improve to rF2 standard their mod. I have to say that the job deserved much more attention than I thought and this release will be more than a conversion/porting. Everything during the development was very interesting and educative. As due to the original author, during the conversion / remodeling / improvement to rF2, I tried to preserve the original essence of the mod, that mainly matches the real-world car developed in the 2006. Renault Megane RS N4 Extreme 2.0 Turbo 4x4 mod. ISI Megane base. This is an initial release that contains only the Mk1 and Mk2 cars. See below for a list of known issues and planned improvements. - Added mk3 and mk3b models. These are based on the physics of the Howston G6 originals. The mk3 and mk3b cars are added as a separate car to the mk1 and mk2 and use different skin templates. AI drivers and liveries are mostly based on the real life 1967 and 1968 Can-Am and USRRC seasons with a couple of 1969 ones to help pad out the field. - Improved glass material settings and enabled cube-map. - Made rollbar texture paintable and added car specific variants where appropriate. Paintable using 'EXTRA1' wildcard. 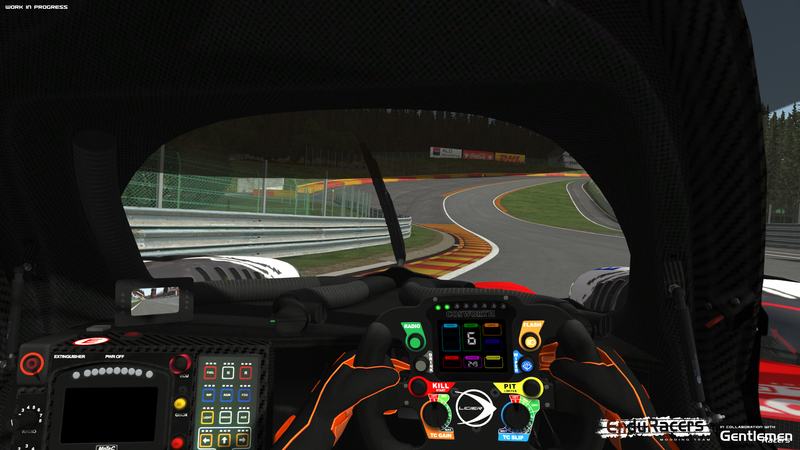 - Added driver specific helmets, particularly for the more recognisable drivers. Paintable using 'HELMET' wildcard. - Added new driver dust mask and textures. Paintable using 'EXTRA6' wildcard? - Adjusted body material settings and textures for improved specularity and reflections inspired by the work of Tosch for the Apex GT3 mod, thanks to both of them. - Adjust body generated dirt and weathering to be a bit more subtle. - Various individual skin fixes and colouring tweaks. - Added missing shift light. - Fixed flickering gauge glass material. - Rebuilt seat to fit cockpit bodywork. - Improved fibreglass texture and dirt/weathering. - Improved cockpit bodywork, now includes accurately modeled doors. - Added 'pontoon' ram air intakes as an option. These come with an improvement in power and torque but more weight and drag. - Improved tail light chrome texture and material. - Fix unwanted reflections from a few key areas. - Added unique intakes and exhaust textures for the different engine upgrades to make them visually identifiable. - Split Engine physics from the "Model" upgrade into its own upgrade. - Improved headlight and tail light textures and implemented light flare shaders. Thanks to Some1 for creating them and making them available to the community. - Improved driver physique (now includes seatbelt) and animation. - Fixed bonnet view cam clipping through nose bodywork. - Added additional Lods for minor components (Headlight reflectors, Rear Wing Parts). - Added Missing A.J. Foyt driver to AI .rcd file. -Pitlights and -lines to better see where you enter/leave the pitlane and when it's red light, to avoid penalties. It features the IMSA Toyota Celica GTO and semi-fictional street track Lester. The track is not featuring wet reflections. It's an art choice, not because wet reflections are bad, but because it automatically triggers the mirage effect on dry road. This effect is neat, but we found that it wasn't fitting well with the decaying and rough athmosphere of the track. We could have asked people to turn road reflections off, but it's a general setting and it affects all mods. We didn't want to bother players with specific settings for our mod. It is supposed to work well straight out of the box. If we succeed in fine tuning wet reflections and be happy with the dry road effects, it will be part of a future update. * If you have any question, please contact me via e-amil.